Enjoy a charming park that will leave you and your family smiling, the fresh and laidback feeling invites you to a day of fun and enjoyment. 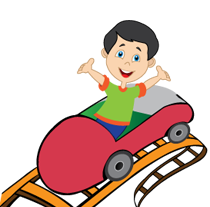 There is a good assortment of flat rides you expect to see at a classic amusement park, as well as two wooden roller coasters. One is the adult-sized Tornado, a good deal of fun. There's also the Teddy Bear, a junior-sized woodie based upon the one once found long ago at Coney Island. A train ride encircles the perimeter of the facility, giving a nice, scenic ride. There is a large picnic shelter as well as many tree-lined picnic tables that make up the grove section. There is a large picnic shelter as well as many tree-lined picnic tables that make up the grove section. Stricker's Grove currently doesn't have discounts or specials. Click here to visit their website for updates.